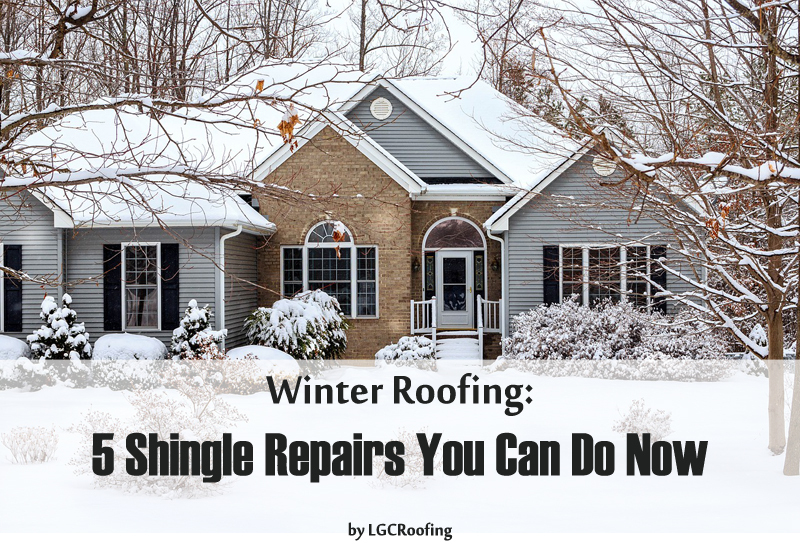 Winter weather can be hard on your shingle roof. High winds, flying debris, ice dams and the freeze/thaw cycle can all cause significant damage. If an entire roofing system needs to be replaced, most homeowners choose to wait for warmer weather before having the work done. 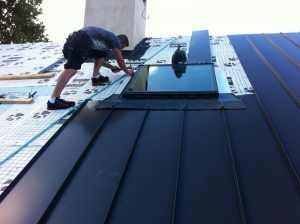 Spring is a great time to handle replacement – installation cost is lower than in summer and fall months as contractors offer better deals during slow spring season, plus the mild temperatures create optimal conditions for installing a new roof while allowing the materials to settle before summer’s arrival. However, if common winter roofing problems develop and you need to handle some repairs, those can be handled at any time of the year, and winter is no exception. Addressing minor shingle roofing repairs now can help prevent big problems later – leaks can be stopped in their tracks, costly decking damage that would sure develop can be avoided, and minor fixes can be dealt with before they become bigger problems. If you need to repair your roofing, the best course of action is to seek out an experienced roofing contractor who can inspect your roof and address any issues. However, if you’re a more hands-on homeowner, there are a few winter roofing repairs you may be able to tackle on your own. Important to note: Before starting any project, be sure to look into any needed building permits. In some cases, an inspection may be required after you’ve made repairs. Also, make sure you’re following all of the manufacturer’s instructions, particularly with regard to outside temperatures during the repair or installation. Small holes or cracks in shingles can often be repaired with roof sealant, applied with a caulking gun. Use your hand to pull up the cracked shingle, and place a lump of sealant underneath the crack. Press down on the shingle and hold it in place for about 30 seconds. Then, apply additional sealant on the top of the shingle, using a putty knife to smooth the sealant evenly in place. Torn shingles can be fixed by applying roofing cement on the back of the torn section with a putty knife. Then press the two pieces together so they bond and adhere to the shingle underneath. Next, nail the shingle into place. Curled shingles can often be cemented back in place. Badly damaged individual shingles may also be replaced. Use a pry bar to carefully remove the nails, and slide the shingle out. Replace the shingle and apply roofing cement to the new nail heads and to the bottom edge of the new shingle, and the shingle above. If ice dams are a problem, look into installing or improving ventilation in the attic, which is the root cause of ice dams. Anything beyond minor repairs listed above should be handled by your local roofing contractor – repair mistakes can lead to significant damage down the line and winter roofing sure has its own risks and challenges. Contact LGC Roofing today to schedule a comprehensive roof inspection or request a repair estimate to fix your damage. Call 609-712-8157 in NJ or (215) 932-7850 in PA for your FREE ESTIMATE today! LGC Roofing is a family owned/operated Pennsylvania roofing installation & repair contractor with over 30 years of experience in residential & commercial roofing! Servicing Bucks, Montgomery County, and Lancaster, Pennsylvania, our focus is on providing top quality workmanship and outstanding customer service to our PA customers.